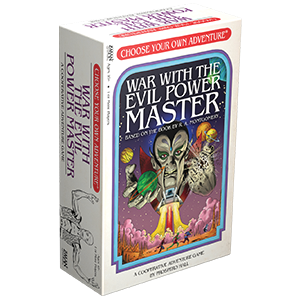 Order Choose Your Own Adventure: War With the Evil Power Master at your local retailer or online through our website today! An alarm blares, filling the halls and echoing down to your room. A booming voice proclaims, “Sudden total destruction of planet Marzina. Sector 31-47-89. Evil Power Master claims responsibility!” You leap out of bed. No one had heard from the Evil Power Master in years. Everyone thought he disappeared, maybe even turned away from his evil power mastering ways. Looks like everyone was wrong. You grab your comm device and quickly send out a signal to the Rapid Force Crew. Looks like it's time to save the galaxy. A powerful villain? Check. Inexplicable destruction? Check. A plucky young team of heroes trying to save the galaxy? Check! Explore a brand new cooperative narrative adventure with the next entry in the Choose Your Own Adventure game series: War With the Evil Power Master! Pre-order your copy through our webstore or your local retailer today. 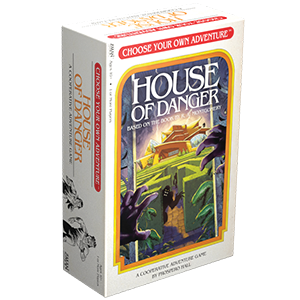 House of Danger took us to solve the mystery of the Marsden mansion. 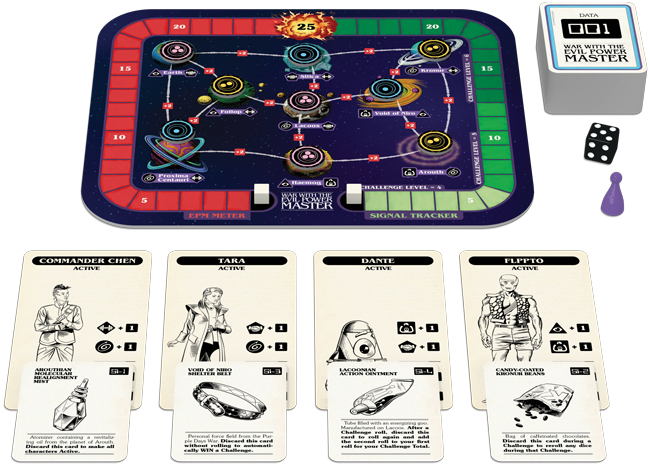 Now it’s time to take to the stars and explore the furthest reaches of the galaxy in War With the Evil Power Master, the newest cooperative narrative adventure adapted from the classic Choose Your Own Adventure book. For centuries, the Lacoonian System, an alliance of the most advanced civilizations in the galaxy, has lived in peace. But now the Evil Power Master has returned and is leading a destructive rebellion. It’s up to you to lead the Rapid Force Crew around the galaxy, using your galactic map to chase down clues to his whereabouts to stop him from enacting his sinister plan! There are 9 locations in the Lacoonian System where the Evil Power Master could be hiding. Maybe he's hiding in the cloudy rings of Kronur or the black depths of the Void of Niro. You must navigate the stars carefully to find the Evil Power Master. If you can track down enough clues to boost your signal, you'll discover his whereabouts. But beware! The Evil Power Master is an excellent minion organizer and will throw many challenges your way as you try to stop him. With the looming threat of the galaxy's greatest villain, the Rapid Force Crew must band together to thwart his dastardly plans! Ready and willing to stop the Evil Power Master and bring peace back to the galaxy, each member of the crew has their own strengths and weaknesses. Some will be better suited for challenges than others. 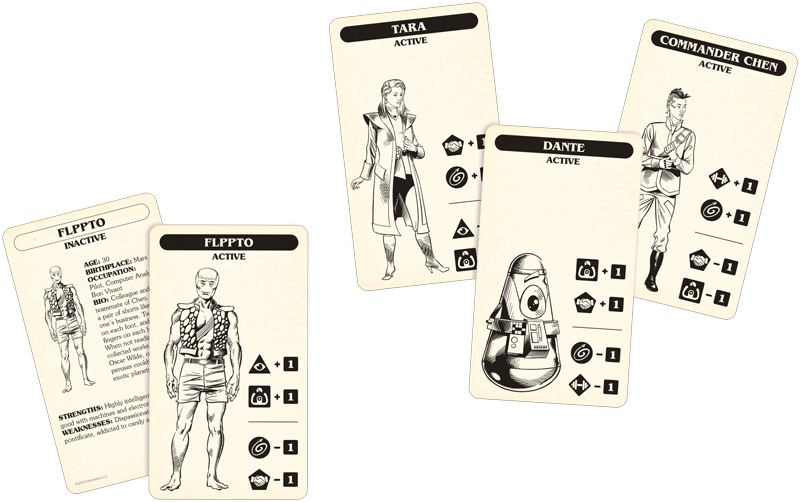 You’ll need to use the crew’s skills in piloting, diplomacy, dexterity, perception, and strength strategically to conquer the challenges the Evil Power Master throws at you. The Rapid Force Crew is made up of four members. The courageous Commander Chen is young and a bit of a hothead but his strength is good for a fight. A decorated veteran and a diplomat, Tara won't take any nonsense. She'll negotiate a peace with the enemy before they even realize they're the enemy. Tara's loyal droid companion Dante may not be the best in a fist fight since he doesn't actually have fists, but if you ask him to do a barrel roll with the ship, he'll successfully do three in a row and land on the planet before your stomach settles. More perceptive than most, the Martian Flppto can see the tiniest of movements from across the room. No one can sneak around when Flppto is there. Just don't question why he's always wearing shorts. To prepare for your mission across the galaxy, you'll need the best equipment space money can buy. 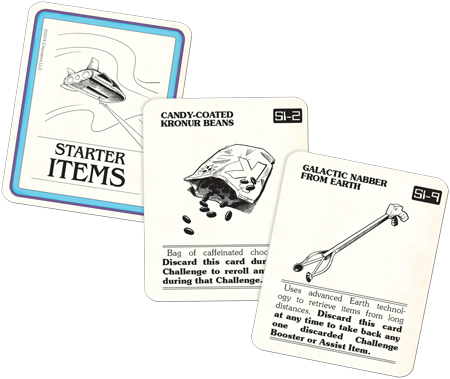 Candy-coated Kronur beans provide a helpful jolt of energy when faced with a dire challenge and the galactic nabber's long arms can snag back a useful tool. With these and the other items you find in your travels through the stars, the Evil Power Master doesn't stand a chance! Follow the clues, conquer challenges, and chase down the Evil Power Master for an epic final showdown. Will you be able to stop him from doing his evil thing in order to save the galaxy? Pre-order your copy of War With the Evil Power Master to find out! War With the Evil Power Master will be $24.99 and release summer 2019.